Lovely travel size bottles are perfect for a weekend away. 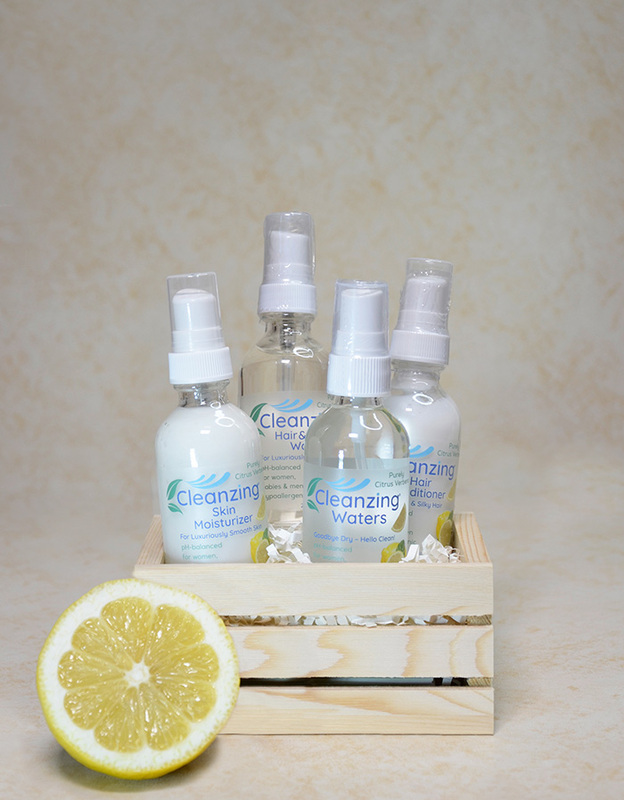 Basket includes one of each of our Cleanzing Wash, Conditioner, Moisturizer and Waters. Each bottle is portable and refillable. Choose your scent. • Cleanzing Wash – Hair, Hands, Body & Face. One product for natural & organic luxurious total body cleansing & softening. pH-balanced for women,making it suitable for men, women & babies. Hypoallergenic, dermatologist-tested for every skin & hair type, including color-treated. • Cleanzing Conditioner – Love & luxuriate your hair with all natural & organic goodness. Best value & performance:out performs the most expensive conditioners that cost 2-3x more $. Excellent for every hair type. Hydrates, softens, shines, & restores hair. • Cleanzing Moisturizer – Hypoallergenic & dermatologist-approved. The most sensitive skin types are softened and hydrated with natural goodness. • Cleanzing Waters – Provide the most soothing, all-natural, economical, and eco-friendly wet wipe for your toilet experience. Hydrate & clean your face, or remove make-up with luxurious goodness. Delight your skin any time of day with a refreshing spritz that revives & awakens your senses. Makes baby clean-ups convenient, kind to your wallet, & ocean-healthy.